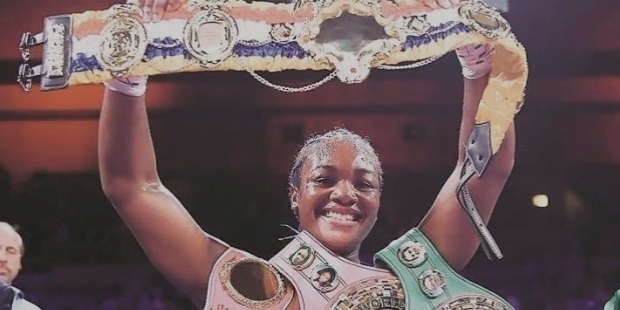 She turned 24 on the 17th of March 2019 and Claressa Maria Shields has earned her magnificent birthday present by becoming the undisputed women’s Middleweight World Champion on the 13th of April 2019. She defeated the unbeaten Christina Hammer from Germany in a ten-round contest. 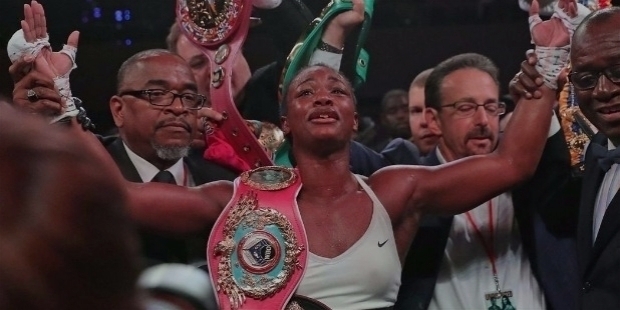 Her spectacular win unified the IBF – International Boxing Federation, WBA – World Boxing Association, WBC – World Boxing Council and WBO – World Boxing Organization Middleweight titles’ win to become the undisputed World Champion in the category. Claressa Shields won the bout unanimously with an impressive three-judge scorecards’ decision 98-92. It was her ninth win as a professional. She has not lost a single bout so far to register a record 9-0. 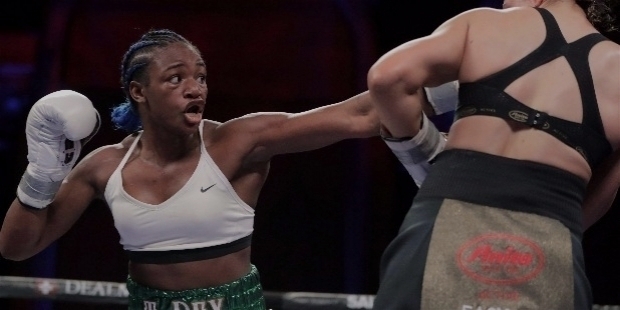 Claressa Shields has won 7 of her 9 bouts by decision and 2 wins came as Knockout. Boxers are a breed apart from the rest of the sports individuals. As soon as they win, they will let the whole know that they are the best. Claressa Shields screamed in ecstasy, joy and heat of the moment at the crowds – “What’s my name?” She exclaimed, “I don’t even know, if I’m dreaming right now. I don’t know what this is! Women’s boxing, we are on fire. I can’t wait to see what’s next for us.” She went onto proclaimed that she is the best woman boxer ever in the world. Johnny D unravels the successful journey of Claressa Shields in the past 24 years. The title bout was hyped because of the reputation of Claressa Shields and Christina Hammer. It contest was touted as the biggest women’s boxing match in the history. Before the bout, the two-time Olympic Gold medalist Claressa Shields stated that her Olympic bouts were a much bigger deal. Shields and Hammer both played the psychological games by scaring each other with words play, as is the norms are prevalent between two boxers. The first round started with Hammer taking the centre stage. Shields allowed her to take an upper hand with an intelligent game plan. Hammer’s left hands blow was blocked by Shields. In return, Shields jabs the body. She connects with a glancing blow on a left hook. Shields did not allow Hammer to dominate her. In the second round, Shields connected on a hard hook to the side of Hammer’s head. She was active and hammered Hammer with four quick left jabs. It was a close round. Hammer started the third round with jab combo. In return Shields lands a hook to the body while slipping another combo from Hammer. They both were cautious during the third round and gave no rooms to each other. In the fourth round, both the boxers were matching their blows point to point. The referee warned Hammer for tying up. Shields held the upper hand with 3-1 score. In the fifth round, Shields played a defensive game. Hammer was not able to land a single clean blow on Shields. She parried everything from the outside and landed on Hammer better shots on the inside. Her blows were taking a toll on Hammer. The round was dominated by Shields. In the sixth round, Hammer displayed her aggressive intent. Shields went on her back foot. Hammer gave two nice hooks to Shields. Hammer scores 4-2 over Shields. In the round seven, both starts punching each other with winging hooks. Hammer gets to score a nice uppercut and followed it with a pair of light hooks. Hammer is warned for the second time for holding Shields. A flurry of big blows start coming from Shields. Hammer backs up. Round eighth starts with Hammer firing off a killing punch at Shields. Claressa Shields parries to circle away. It was her time now to swarm Hammer with flinging hooks on the inside. Hammer is taken aghast, as she loses her mouth guard. Shields swarmed Hammer and soon lands two big right hands of hers. With the score in favour of Shields 6-2, Hammer was losing her grounds. In round nine, Shields counters Hammer’s quick hook with a counter left right on the jaw. Both the boxers were at par with their performances. Shields dominated the round with three-punch combination scoring 7-2. She switched gears to come forward with lefts on Hammer. Shields kept counter attacking Hammer and hurt her. In the final round, Shields gets a left jab from Hammer. She returns a nice hook up top on Hammer. Both of them were matching blows with blows. Shields landed a left jab on Hammer, followed by a triple to win the bout 8-2. It was certainly a see-saw bout between the two with the three judges’ verdict going in favour of Shields 98-92. 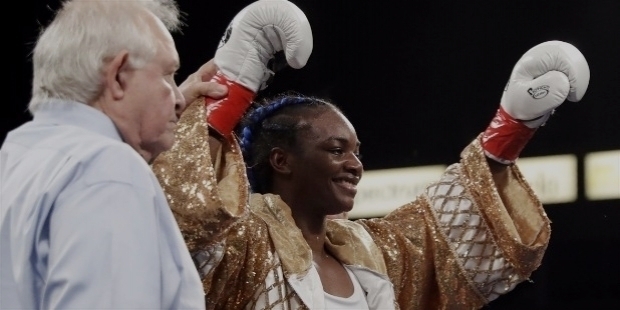 Having won the title, Claressa Shields called out Cecelia Braekhus and Savannah Marshall. Marshall is the only woman to beat Shields. Claressa Shields had earlier won three World titles before this bout. The so far undefeated Christina Hammer with 11 KOs to her credit had to settle with a 24-1 record after the loss. In total, Claressa Shields landed 112 out of 387 punches as compared to Hammer’s 49 out of 366. 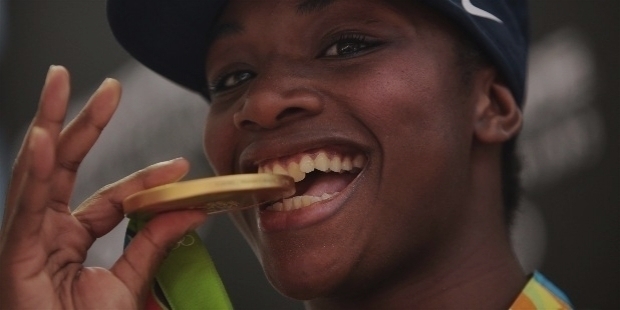 In the London Olympics in 2012, Claressa Shields won her first Olympic Gold medal in the Middleweight category. She repeated her feat at the Rio 2016 Olympics and won her second World Championships’ Gold medal. In the following years, she went onto win three World titles. Christina Hammer has been boxing since a decade plus years. Hammer is a multiple-time World Champion in two weight classes. She had held the WBO female middleweight title from October 2010 to April 2019. Christina Hammer is the youngest boxer in history to win a WBO title. Claressa Shields called out on Cecilia Braekhus and Savannah Marshall for the next bout. It is interesting to note that Cecelia Braekhus was the first woman to hold all the major World Championships’ belts in Welterweight category to etch her name in Boxing History in 2014. Claressa Maria Shields was born on the 17th of March 1995 in Flint, Michigan, USA. Father Bo Shields used to box in underground leagues and spent nearly 7 years in jail. When Little Claressa was nine, Bo Shields told her about Laila Ali. The seed of interest in Little Claressa was germinated. At the age of 11, Claressa started boxing at Berston Field House in Flint. Her natural instinct was noticed by Coach Jason Crutchfield. The rest is now history. Claressa has been highly influenced by her grandmother, who encouraged her a lot. Claressa Maria Shields was born for greater achievements in life. In the year 2011, she took part in the Open-Division tournament – the National Police Athletic League Championships 2011 for the very first time. As a junior, she had earlier won two Junior Olympic Championships. Shields won the middleweight title and qualified for the U.S Olympics Trials. 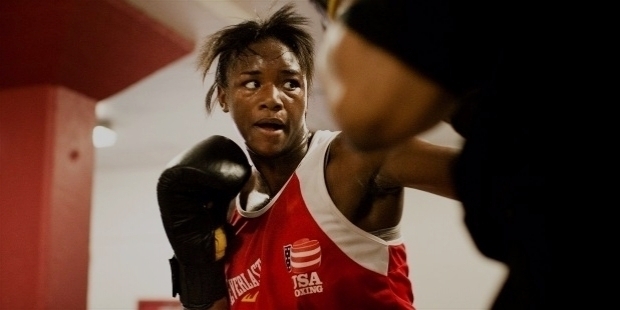 In April 2011, Claressa Shields won the Women’s Elite Continental Championships in Cornwall, Ontario. Her opponent in the final was three-time defending World Champion Mary Spencer of Canada. At the 2012 Olympics Trials, Claressa Shields triumphed over the reigning National Champion Franchon Crews. She went onto win the first Olympic Gold medal in the middleweight category at the 2012 Summer Olympics in London. She triumphed over Russian boxer Nadezda Torlopova. Claressa Shileds was ruling the world stage. She won the Gold medal at the 2014 World Championships. In 2015, Shields became the first American woman boxer to win titles in Olympics and the Pan American Games. She followed her superb form by winning the Gold medal at the 2016 AMBC Olympic Qualifying tournament in Argentina. In Rio Olympics, Shields won her second Olympic Gold medal defeating Netherlands’ Nouchka Fontijn. 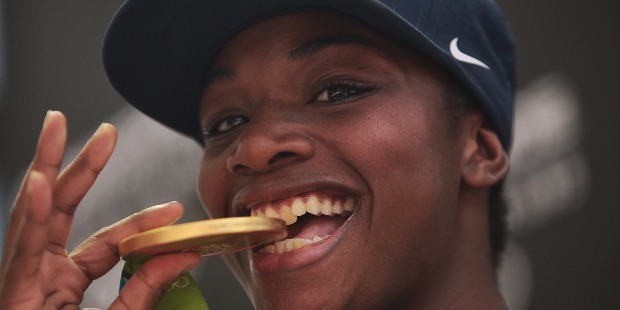 Claressa Shields became the first American boxer to win back-to-back Olympic Gold medals. She has had an amazing record of 77-1 with 19 KOs in her amateur career. Claressa Maria Shields turned ‘Pro’ in November 2016. She triumphed over Franchon Crews in her first bout. On the 10th of March 2017, Shields defeated Szilvia Szabados to lift the North American Boxing Federation Middleweight title. On June 16, 2017, she triumphed over Sydney LeBlanc in her first scheduled eight-round bout. In August 2017, she defeated Nikki Adler, the defending Champion for the WBC Super-Middleweight belt. 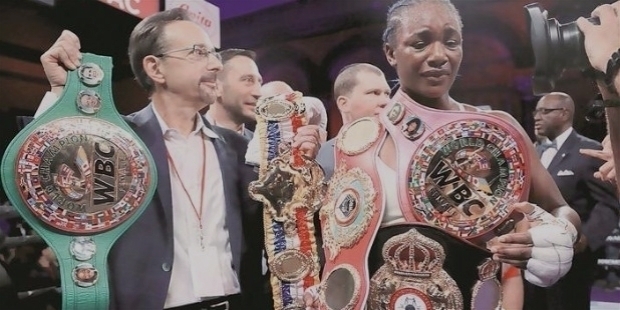 On the 12th of January 2018, Claressa Shields won the WBAN Super Middleweight title. She triumphed over Tori Nelson. She also retained her WBC and IBF female super-middleweight titles. On the 22nd June 2018, Shields won the vacant World Boxing Association and International Boxing Federation middleweight belts by defeating Hanna Gabriels. 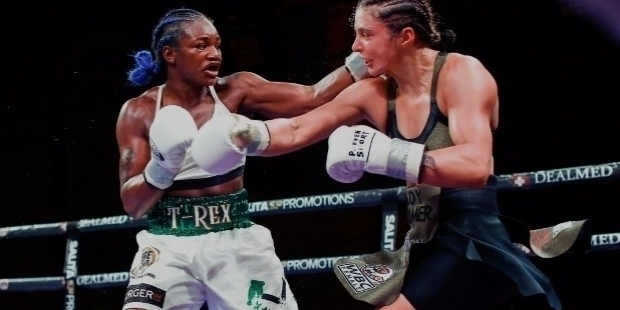 Claressa Shields became the undisputed women’s middleweight World Champion on the 13th of April 2019, when she triumphed over Christina Hammer. She became the second woman boxer to unify the WBA, WBC, IBF, WBO and The Ring women’s middleweight titles. 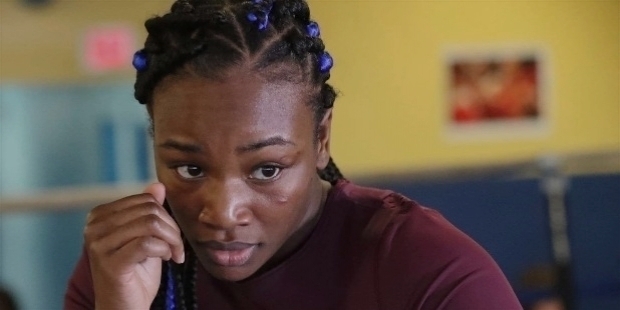 Claressa Shields lives alone because of family issues. She has found her strength in her Christian faith to concentrate on her boxing career. A documentary titled ‘T-Rex: Her Fight for Gold’ was based on her life in 2015. Her successful journey will be made into a film by the Universal Pictures. She is also likely to be seen in director Susan Seidelman’s film titled ‘Punch Me’. In the year 2018, Claressa Maria Shields was inducted into the USA Boxing Alumni Association's Hall of Fame.